AVG Anti-Virus 2011 is the newest version of Anti-Virus from AVG Technology. The design of the AVG Anti-Virus 2011 is based on the feedback from AVG’s global community which consists of more than 110 million users. The AVG Anti-Virus 2011 has been improved with powerful Web-security features which includes enhanced social networking security, enhanced speed and detection rates, in addition to usual easy to use and intuitive user interface. 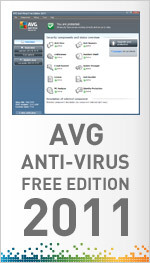 The AVG Anti-Virus 2011 is available in paid and free edition. The Anti-Virus 2011 Free Edition is a free version of AVG Anti-Virus 2011 which is designed for those users who perform basic online activities such as surfing the Internet, conducting web searches or social networking. Surf and search with confidence AVG LinkScanner’s real-time protection. Stay protected on social networks with AVG Social Networking Protection. Enjoy a faster running PC AVG Smart Scanning works while you’re away and runs in low-priority mode when you return. Stay up-to-date with the latest threat information from the AVG Community Protection Network and AVG Protective Cloud Technology.